Maybe, but it was good to see someone giving that spoiled little brat a piece of his own medicine. It probably won't do any good, though. It's clear Verstappen doesn't learn from his mistakes, probably because he doesn't recognize them as mistakes. That's why after two and a half seasons he still drives every GP like it's his first one . . . completely caught up in his own hype. You really think that this season he has more dirty driving to his name than a lot in the midfield? He's been pretty clean compared to most. I mean, are you able to give an example of dirty driving this year from Verstappen that at least a few other drivers haven't done? Looks like all the Aussies and Ricciardo fans have come out in force to kick the new guy when he's down. It's mathematics son; you can argue with me, but you can't argue with figures. He's cost himself 2 podiums with collisions with both Massa and Ricciardo, the fact he was able to carry on in both races was just luck, also I think trying to go around the outside of 2 cars into a chicane and then crashing out of the race because the 2 cars on the inside came together is not simply bad luck. Let's not also forget he clipped and damaged Vettel's front wing which could very easily have punctured his rear tyre, all these are examples of over aggressive driving, some he got away with, some he didn't, you drive like this then the chances are that some of the races you either don't finish or you have to come into the pits for repairs. You watch the screen shot with Massa and you see Verstappen's outside wheels partially off the track, ahead of him there's not enough room for him to get back on the track but he's got nearly full right lock on towards Massa's car despite the fact that their front wheels are nearly touching, trying to force himself back onto the track with seemingly no fear of the contact that might come. Blaming him for Spain is absurd. It was a standard move that many drivers take at the start. The blame of that accident is 100% on Bottas. Verstappen was plain unlucky. No driver would not have gone for that because they were worried about cars coming together on the inside of them. That aside I agree he puts his car in a position where it is going to get hit and that is something he has to work on but I really don't thin the weakness is as big or costing him as much as people make out. Bottom line - He's cost himself probably around 20 points this season and that's if you blame him for the incident with Massa yesterday which was Massa's fault but could have been avoided. Retirements from mechanical failures have cost him around 90. I personally think all 3 drivers played a part in that incident in Spain. Bottas did brake early which admittedly, did create an opportunity for Kimi and Verstappen to pull along side. But they both took the risk. It was up to them. Bottas went as tight as he possibly could. Kimi had to go tight too because of Verstappen being alongside him. Verstappen could have easily gone wider but it is difficult to see you have 2 cars on your inside. I still think a racing incident was easily the most sensible decision. I strongly disagree with Bottas being 100% at fault. In a way, they all were fully responsible for it happening as they all could have done something differently. Each driver could have prevented it but it will have been difficult to predict what was happening. Also consider that since it was deemed to be a racing incident and 2 of 3 drivers retired. The one that didn't retire didn't get any sort of penalty, then I don't see how they could have thought Bottas was any more responsible than the other 2 at all. If anything I think Bottas was leased responsible as he braked early and it was the other 2 drivers choice to come along side and then Bottas just ran out of space. Even the commentators on Channel 4 who usually hype way too much about Verstappen thought this was just a pure racing incident when looking at the replays. I also agree with Pokermon about what happened with this incident with Massa. It is the same on Sky, they usually hype about Verstappen but when Brundle saw this move, he seemed to think it was hard from Massa but fair and no action should be taken. Verstappen had 2 overtakes this race that resulted in contact. The one with Massa I think has to be considered his fault since he was the one who got damage and Massa didn't get investigated any further. I think it is very likely that if the exact same think happened and Massa was the one who got the damage, Verstappen would quite possibly have had a penalty. I do think Verstappen has been extremely good in qualifying. He also usually stands out in the start of the races. But he somehow manages to be involved in so many incidents. Most haven't been his fault but several have been at leased partly related to him. I personally don't think we have had enough on track evidence this year during the races to say Verstappen is better than Ricciardo. In qualifying. That is quite clear that he is overall better. The start of the races is often better for him too. But the only race we have been able to compare them both when they have had a trouble free weekend is Monaco. I'm not counting the races where either one of the drivers has had to start from near the back and I'm also not counting them if they race had got affected by a puncture like Verstappen had last race. Hard to believe this really. They have had so little time racing each other. I know Ricciardo has been a little lucky, but we have had loads of evidence that he has been an extremely good driver this year that brings him results. I don't want to say Verstappen isn't capable but he's only shown to be outstanding in China to me. Ricciardo has had 2 messy qualifying sessions, but totally made up for it in one of the races. Even if he didn't win and finished 4th, that still will have been good for Red Bull in Baku. He was lucky but I think Ricciardo has to be about the best driver on the grid at performing really well in the race when given an opportunity. When he sees a possible great result coming he can usually do everything perfectly. I also think his style of overtaking is really good too. And his attempts never seem to result in contact unlike Verstappen. Although loads of you here will disagree, I still think Ricciardo is overall the better driver. I know we haven't really been able to compare them during the races but Ricciardo has looked really good and kept out of trouble where it matters and we haven't really seen this from Verstappen. I know his reliability has affected him a lot and once we get the chance to see them both racing each other again, I could be proven wrong. But in the races, I do personally think Ricciardo is better. Some here seem to be a bit revisionist also - in Austria - the penalty Max (rightly) got - did NOT cost him a podium. If he'd driven normally at turn 2, he'd have been in 5th place behind Dan (who clearly had track position and the inside line into turn 3) and with Lewis right behind Max. Overtaking at Austria is hard and Dan is very good there - he'd also have had to defend against Lewis - and I think with issues for Ferrari / Bottas - the only real chance of a podium (all else being equal) was Dan - or at best both with Dan ahead. At Monza - the move on Massa was clumsy and you'd have to say it was primarily Max's fault - and there were other incidents in the race where Max was involved - although the complaint by Magnusen was ridiculous as Max had taken the position and was fully in front - so IMO he 'didn't' push Magnusen wide. Some chances need to be taken to overtake - and it can be a fine line as we want to see racing surely - but Max has been racing since he was a child - and has been influenced towards F1 by his dad since he was a child - so while young in years, Max has had as much racing experience (broadly) as drivers 5-6 years older. He's now had 53 F1 races and some test driver duties before that - so his learning curve should be levelling off. Well you're doing it again... haven't looked at which ones were mechanical retirements but during all the races up to Italy in the years 2009-2013 Vettel had a combined 7 DNF's, Webber 4. I could care less about 2009-13 and VET vs WEB, so I'll just break the Covalent bonds with a quote from 2001, A Space Odyssey, that seems to fit. "This communication servers no further purpose. Good-bye." Sorry genuinely confused. You mean Hungary right? Most of Webber's problems were not outright retirements. He had all those KERS system failures and such that cost him dearly in qualifying and on lap 1. Mark used to lose multiple positions on the first lap almost every race for a period of time. I thought the incident with Massa was a big error of judgement. Not so much regarding blame, but the extent to which he should have seen it coming, it's inevitability and the time/opportunity he had to avoid it. About 0:03 ish when they are side by side and Max is pointing towards the speed bumps. At that point there is already no possible way he's going to make corner and not collide with Massa. Massa is too deep to give him room even if he really wanted too. Yeah I mentioned that earlier in this thread when looking at one of the screenshots that was posted, you could argue that Massa was a bit naughty but what then Verstappen was attempting to do was not very wise. What Massa did was naughty and I lay the blame for the accident at his door. Unfortunately it's common tactic of the experienced driver when someone is a tempting to overtake around the outside in a chicane. Go too deep and make a situation like we saw on Sunday. The overtaking driver who has effectively got the move done either has to crash or jump across the inside to avoid a crash. After witch the overtaken driver will bellyache like mad about being overtaken off the track. As the stewards refuse to act the only way to put a stop to this is if the overtaking driver lets the crash happen. After a few retirements or punctures/wing changes etc the overtaken driver will soon abandon the tactic. Unfortunately the wrong driver sustained damage here. I would 100% agree that Max could and if sensible would have avoided the accident. I can't help but feel a little happy at his refusal to be gamed like that though. Hang on a bit here Verstappen is probably the worse culprit for this kind of driving and now we are going to play the victim card for him. A starting point would have been to clamp down on what Verstappen does, the fact is that he gets away with worse things then what you accuse Massa of, we can't be having separate rules to suit Verstappen. Verstappen was the victim in this case so it would be misleading to portray anything else. When Verstappen drives dirtily I criticise him for it. I don't believe as you do that he is the "worse culprit" not even close actually when was the last time you saw Verstappen deliberately shove someone else off the road? It happens but rarely compared to some drivers in the midfield. Verstappen get's more attention because he is higher profile but he certainly behaves no worse than a lot of the midfield. Verstappen dangerous trick that got people talking about him was moving over on the straight after the driver behind had committed to his move. He's stopped doing that. He's no more likely to push another driver off the road as anybody else. Who has he had behind him this season, the only driver I can think of was Hamilton who after one aborted attempt to pass Verstappen said he was dangerous and he wasn't going to try again because it wasn't worth the risk. Ricciardo was behind him for much of the Chinese GP, although I don't remember any particularly dangerous defensive moves that time. He doesn't do it with Ricciardo, I believe he's even said generally speaking he gives him more room. Uh, the final lap he did hes good old direction change in the braking zone that cause Dan to take evasive action and run wide. Fair enough I don't remember that. It's not a great angle, but I'm pretty sure it is indeed moving under brakes. Certainly by Indycar rules, that would be blocking. Maybe all the retirements are Verstappens fault. Why did he stay with Red Bull? Why not change team like Hamilton. He may be fast, he might have good starts, certainly a poor decision to stay with Red Bull. Decisions on and off the track make the best drivers. Vettel knew also knew to leave. A small thing called a "contract". Aside from his usual 'I'm going to move under braking' defensive move that forced Ricciardo to lock up. Same crap he pulled on Hamilton at Suzuka last year. So basically he's still doing the same things, that makes it hard to play the victim card for Verstappen. I don't think anyone is portraying Verstappen as a victim generally just a victim of dirty driving in this particular case. No driver has been perfect there whole career. One instance of dirty driving in a season is far less than most on the grid. Since you've repeated this claim multiple times now, how many drivers on the grid have actually done more than one clear-cut incidence of dirty driving this season? Most. And Verstappen has as well. I mean dirty driving rather than just making a mistake. I would class Bottas hitting Kimi in Baku as a mistake rather than dirty driving for example. I guess what I'm saying it's hard to feel that Verstappen was hard done by when if the roles were reversed he would have done exactly the same maybe even if a way that there would be no way that Massa could come back at him? I like Ricciardo, but seriously is he the luckiest driver out there? Every race he has won has been a fluke and he has had the amazing fortune to be the "next best" driver on most of the weekends Mercedes happened to drop the ball in 2014 and 2016. Although Spain went Max's way in 2016 and he was unlucky at Monaco that year too. This year, he has 7 podiums so far. I know he doesn't have the car to pull podiums on merit, but he has 7 of them and in none of them did it look likely until something went his way. A lot of it is good race craft and avoiding turn 1 drama but a lot of it is also sheer luck. One could that having the ability to anticipate and maximise opportunities is the ONLY way to get podiums on merit in a non-competitive car. He's definitely an opportunist, that's for sure. 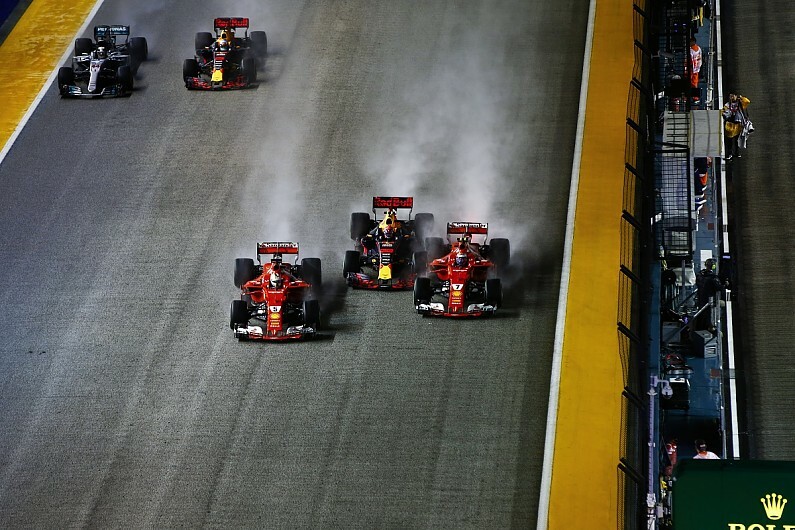 Looking at that effort in Singapore, and purely factoring in the time Max and Dan were racing together, I have to say once again, Max outperformed Dan. He was up there, racing with the Ferraris, while Dan was languishing midfield. Ah, midfield? So we're down to 8 car fields now? If anything Ricciardo has been unlucky that his time in a front running team has coincided with an unprecedented level of dominance from Mercedes. He's also been very unlucky on the rare occasions he has genuinely had the pace to win. Daniel's showing was beyond poor. He's quite the loudmouth about taking oportunities, but yesterday for me it was just a bad showing from him. Terrible. Fancy nursing a gearbox issue and finishing second to a Mercedes that was able to spread its wings thanks to the conditions - beating another Mercedes to boot (albeit one with a rather parched driver thanks to his drinks system failing him). Verstappen should have been able to tell that doing what he did was going to lead to a collision. Been away for a while - taking time to respond to this: no, he shouldn't. He really shouldn't. As I've said umpteen times already, if F2, GP3 drivers can go side by side through the chicane, heck if even Porsche drivers can steer their boats through there side by side, then one should be able to expect an experienced F1 driver can manage it as well. I also think you accept the thinnest possible evidence to say Max is doing better, then ignore anything at all that implies Ricciardo is. Nonsense to the highest degree. My position is simple, that during the time we can compare them like for like Max is doing better, until we can't compare them anymore because things keep happening to Verstappen. I am not detracting anything from Ricciardo for what happens after that. I am just not willing to agree that Ricciardo would have beaten Verstappen if they had both raced on in an uneventful race. Mind you, I also am not saying Verstappen would have beaten Ricciardo in all those races. This is as impartial an opinion as it gets. It's pretty much entirely factual. And yes, I do think the "Ricciardo is slower on purpose in the beginning" and "Ricciardo sets his car up for race instead of qualifying" opinions are huge cop outs, and are only used because they fit. I do wonder when Ricciardo started to set up his car for race instead of qualifying - somewhere towards the latter half of the 2016 season, probably? Seriously, can't you see how convenient that is? Last edited by mds on Mon Sep 18, 2017 12:20 pm, edited 1 time in total. Between laps 4-10 in between the first two SC's, Hamilton did build a 5.2 second lead on him in 6 racing laps. That was before his gearbox issue. Wet weather isn't Ricciardo's strongest point although the two team mates who out shone him are rain masters - Vettel and Max but Vergne was also better too. Kyvat was also much closer to DR in the wet than the dry. I'm not arguing with that. The use of the words, 'beyond poor,' to describe Riccardo's race performance, however, pretty much invited a facetious response as far as I'm concerned.